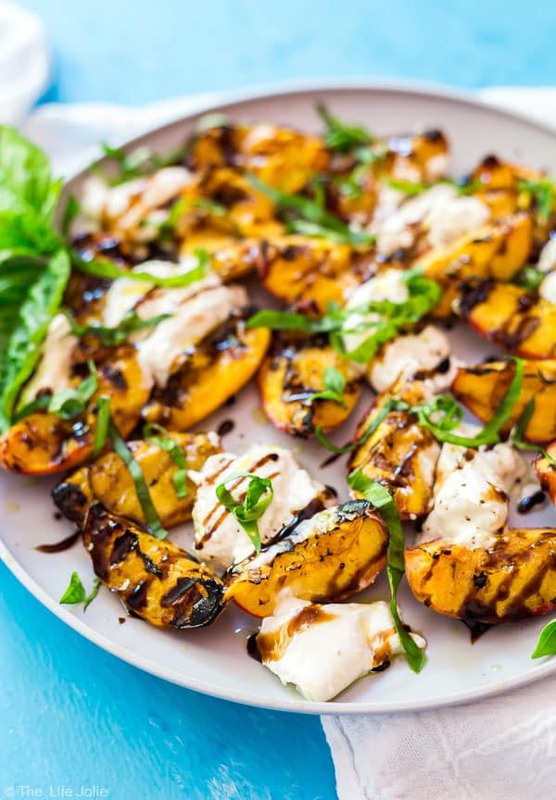 This Grilled Peaches and Burrata Salad recipe is an easy twist on a traditional Caprese salad. 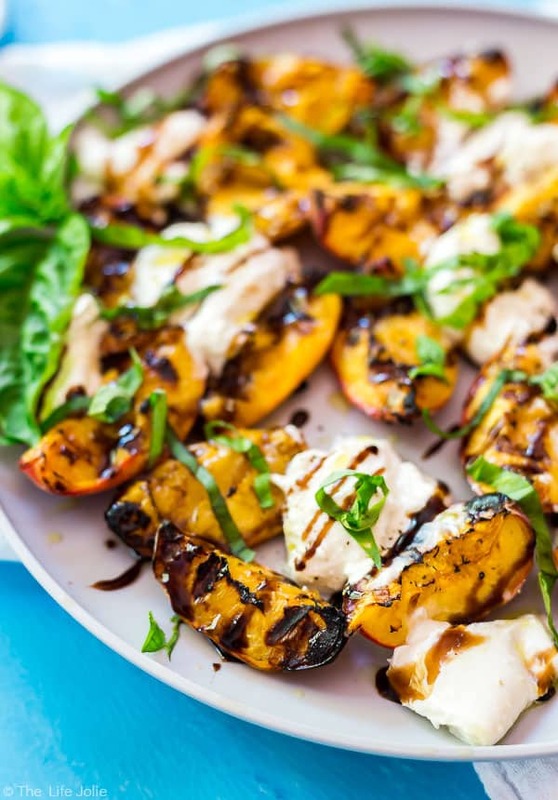 It’s super simple to throw together with peaches, Burrata cheese, basil and balsamic vinegar and is a light and delicious appetizer or side dish for the summer! My girls are major Daddy’s Girls! I know we’ve talked about A being all about her daddy, but recently T has crossed over as well. Gone are the days of T constantly insisting on going to me. Once I stopped being the food source, T was like “You’re dead to me” and that was that. Don’t get me wrong, my girls still love me and know who their mama is. We have tons of fun! But when T gets into one of her moods and only wants to be held, she wants to be held by Daddy. And sometimes it’s not just him! This past weekend, we went to a housewarming party for one of my cousins. She bought a gorgeous house on the other side of town with a gloriously shady back yard. We had spent that morning at one of the biggest (and my favorite) art festivals that our city has every year. When it came time to head out to the party, T had just emerged from her nap but A was still down and J was looking super tired as well. So I told him to stay home with A so as not to wake her from her nap, and I would take T with me. T had all sorts of fun walking around and exploring everything with my dad and when it came time for us to leave, my mom was holding her. When she went to give her back to me, T wanted to stay with her! I was a little bummed about this, but at the same time I was also kind of happy for my mom. You see, in addition to being a Daddy’s Girl, A is also a major Papa’s girl. She often runs straight to my dad before giving my mom hugs (same with my husband’s father!). So to have one of the Grandkids want their Gigi first is pretty sweet! I know it goes in phases. Many seasoned parents have told me there will be times that they prefer me first. And we still have tons of special, bonding moments between us. It’s just interesting to see these phases as they come. You know that song Peaches by The Presidents of the United States of America? I loved that song when I younger- I even had the cassette tape single! Now that I’m older, I understand that it’s not actually about fruit- awwwww, my innocent tween-age mind! But if you ignore the more racy meaning, it pretty much sums up my feelings about summer (“millions of peaches, peaches for me!”). 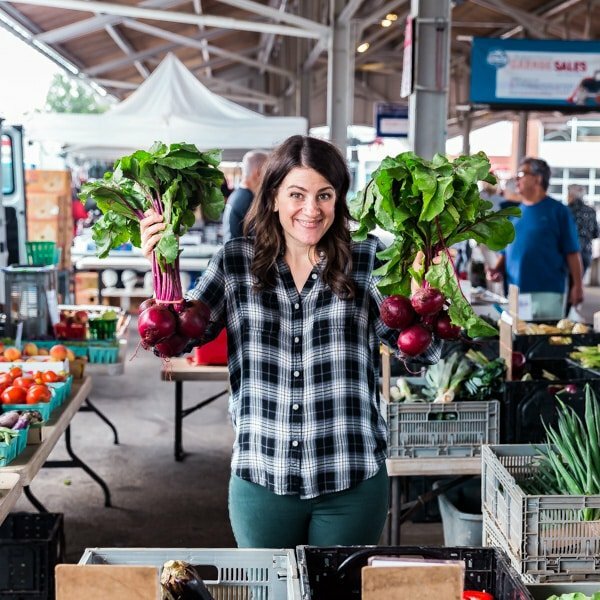 I am absolutely loving all the stone fruit that’s on the market right now (as you probably noticed with last week’s Galette). I truly believe that it’s not summer without peaches! A number of weeks back, I forgot to bring lunch to work and made my way to down to the cafeteria to grab some food. One of the prepared salads they offered that day was a peach Caprese salad, with peaches, basil and fresh mozzarella. Naturally, I was all over that! So much so, in fact, that I decided to make my own version. But since I can’t leave well enough alone, I had to elevate it a bit. Because Burrata > Fresh Mozzarella. That and I adore grilled peaches! When it comes to grilling peaches, I think the key is making sure that they’re ripe, but not mushy. J sprayed our grill down with cooking spray before he heated it and within minutes he was back in with some gorgeous grilled peaches. I actually tried this with plums as well, but they were pretty tart and I didn’t love their texture once they were grilled. 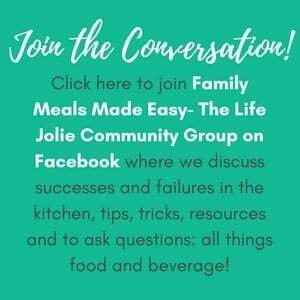 I hope one of you guys try it with plums and have more success- please comment and let me know if you do! Initially, I was a bit unsure about how the photos would come out. It’s not the most beautiful dish to photograph. 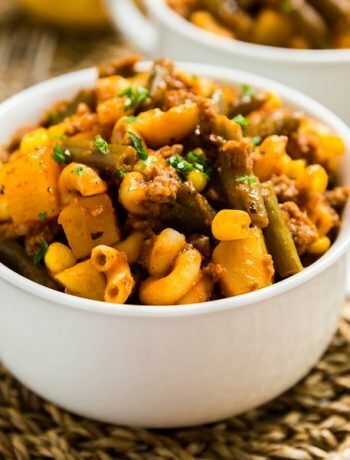 But when I brought it to my parents house to enjoy at our dinner later that night, we all could not stop eating it and talking about how delicious it is. I knew that I had to post it asap so all of you guys can enjoy it all summer! 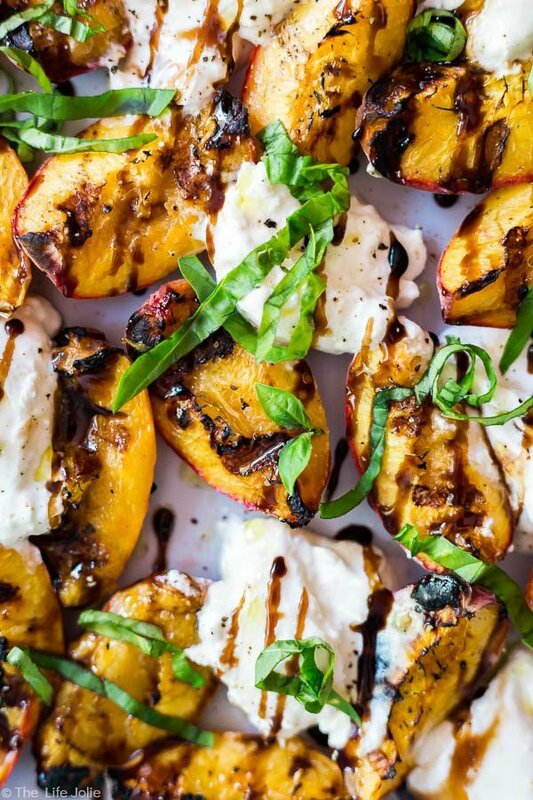 This was super simple to throw together and I think it’s a great thing to grill the peaches in advance and cool them down, throwing the Burrata and the finish touches in just before serving. 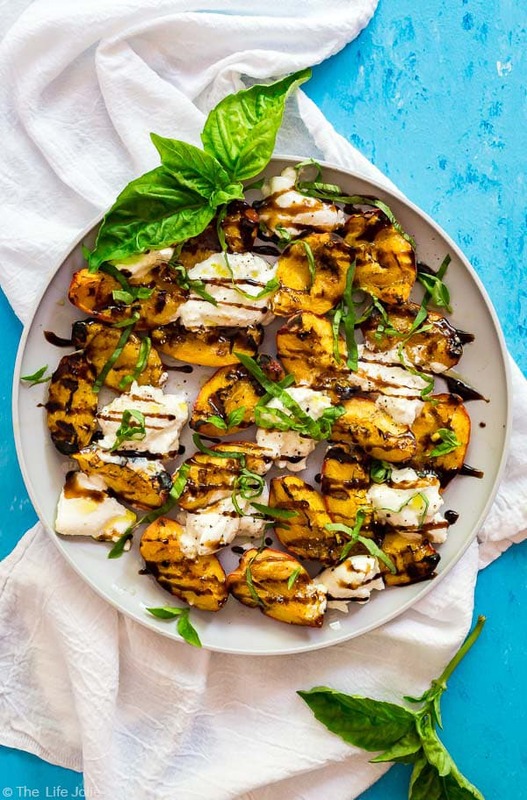 This is a great twist on a traditional Caprese salad and and excellent way to enjoy all those peaches when you accidentally buy way more than you can eat (guilty as charged!). 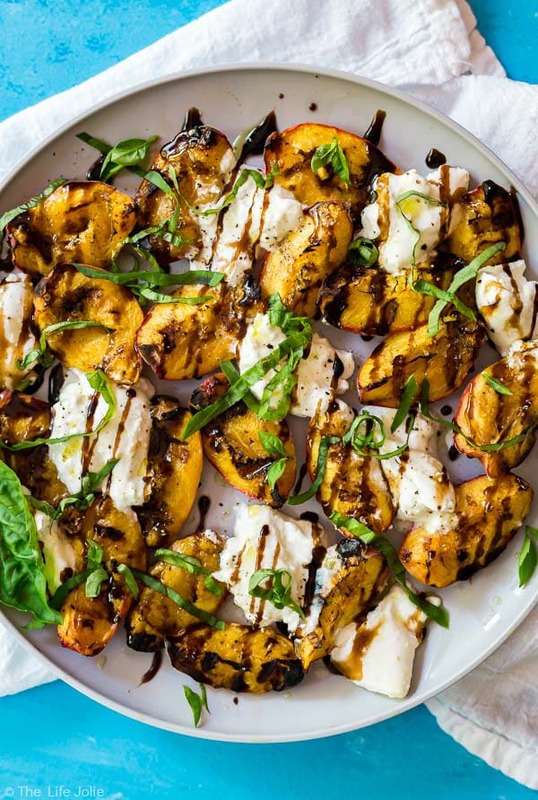 This Grilled Peaches and Burrata Salad recipe is an easy twist on a traditional Caprese salad. 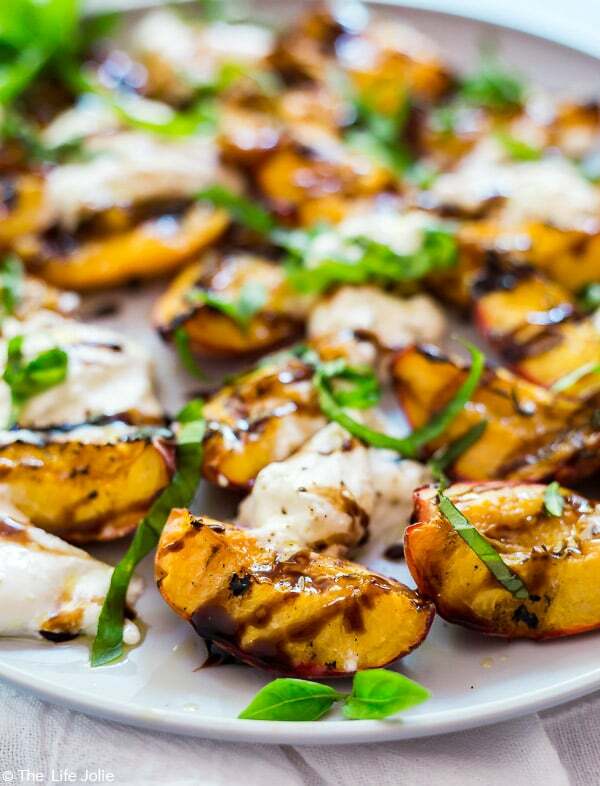 It's super simple to throw together with peaches, Burrata cheese, basil and balsamic vinegar and is a light and delicious appetizer or side dish for the summer! Course salt like Kosher or Malden. 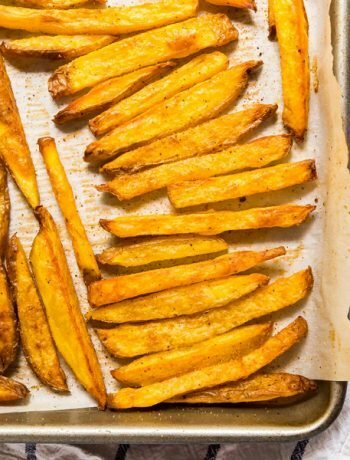 Prepare the grill by spraying it with non-stick olive oil cooking spray and preheat it to medium-high heat. Cut the peaches into quarters leaving the skin on and carefully place them onto the grill. Grill for about 5 minutes uncovered or until they have a decent amount of char (don't burn them!) and then turn the peaches and grill uncovered for a few more minutes on that side. Remove the peaches to your serving platter and let them cool for a few minutes. Once they're cooled, take your Burrata and carefully tear it into bite-size pieces. Scatter these throughout your platter of peaches. Drizzle with olive oil and balsamic glaze. 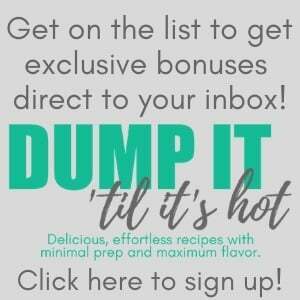 May 14, 2018 at 10:19 pm OH YES!!!!!!!! Burrata is just my utter favorite! It is pretty hard to find here in Oz, I have to drive to a deli 90 minutes away. But we like to make our own mozzarella, it isn't quite as creamy as burrata but it is soooo good. I can't wait to get home and give this a go! May 16, 2018 at 1:15 pm Burrata is my fav too! I'd love to make my own mozzarella but it totally intimidates me. Any tips?